Yeah, that's it and it is true. I went to WW and saw a lot of people I know, they are still there. It was like a reunion of sorts. It was nice. Then I went to 24 and I rode the bike for 25 minutes. I really didn't know what else to do and I don't want to pay for a personal trainer, so baby steps. At least I showed up. It's kind of amazing how I feel. I feel like I've taken control of my life again. I feel like I'm back on top. Weird. Just from going to 2 places. Definitely weird. Came home and made myself a 7 point breakfast with 2 eggs, a pat of butter, a small potato, and a bunch of veggies. Topped it off with some salsa. It was good. I enjoyed it. So I feel amazing and plan to continue that feeling. I have promised myself I'd stick to the program this week and see how it goes. I would love to get below 200 and if I can make some significant progress towards that goal, this week will be a huge success. Go to 24 at least 3 days a week. Walk on the days I don't go to 24. Walk the dogs every day I can. Reasonable and not overly ambitious. I am seriously considering a 4:30 a.m. workout. Crazy I know, but I think that might work for me. At least in the beginning. We'll see. 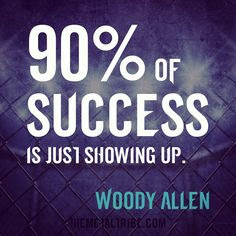 Right now, I'm riding the high of showing up.